This model was one of the first Kyosho's entry in my collection. I’m still fascinated about the real car and the model in the beautiful Sepang blue shade was mandatory for me. 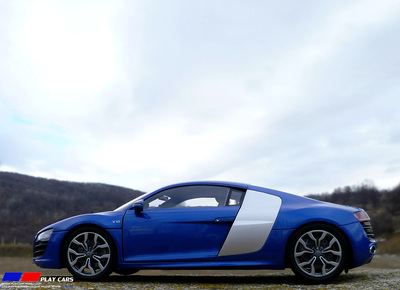 This is a dealer edition and represents the 5.2 V10 FSI engine version. It has some different parts according to the first generation, replicated by Kyosho as well. 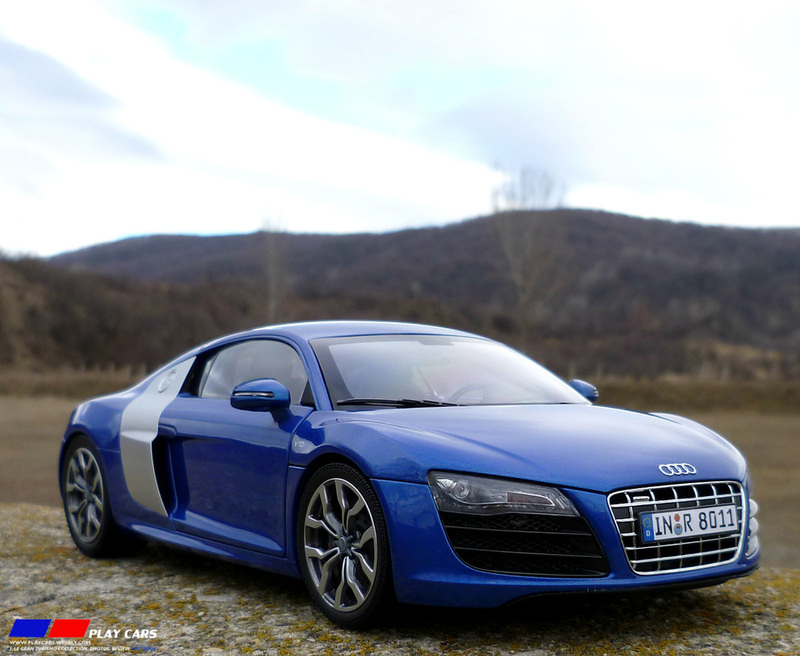 Model itself is fantastic looking and very carefully finished and detailed. 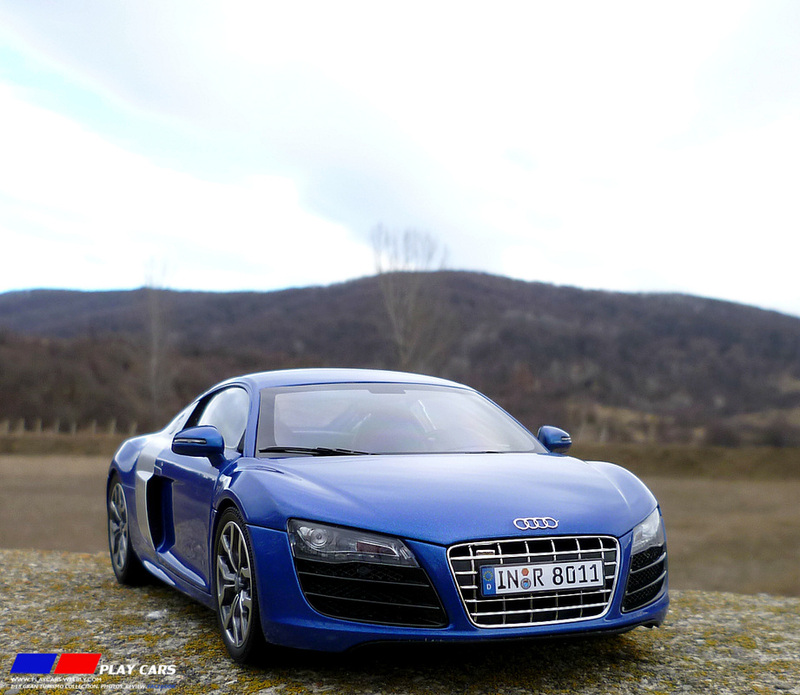 I can say for sure, that is still one of the best Kyosho’s models. Is heavy, correctly proportioned and solid. The paint job is perfect, the metallic paint is glossy, smooth and applied in a thin and deep layer. No shades or differences between different materials could be seen. All the air vents and grills around, provides perforated grills, only the mask is cut-in and has a “deep” effect because of the black plastic used. 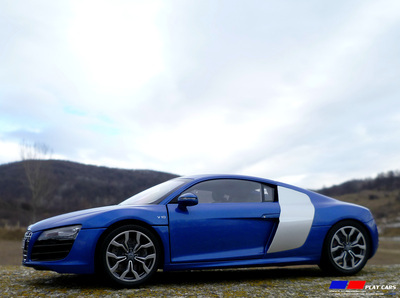 The chrome is qualitative and precisely applied on the front grill and on the final exhaust pipes. On the front grill even the “Quattro” badge was modeled. 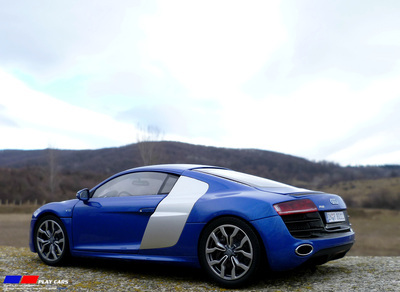 Headlights are detailed and accurately done, having the turn signals in the right color and the LED segment reproduced, but not so precisely as on the roadster version, released after. Same great work can be seen to the taillights level, where the segments were put in evidence and the turn signals keeps the right color and the LED’s format. The external mirrors are plastic made and have the turn signals built in. On the rear lid, a metallic photo etched part replicates the lettering, excepting the four circles logo that is modeled into the body and chrome covered. On the sides, the V10 marks on the fenders are only painted. The photo etched parts are covered by a thin and transparent decal to protect them during the transport and I recommend everyone to peel them off when receive the model, because after a long time is very possible to come out together. 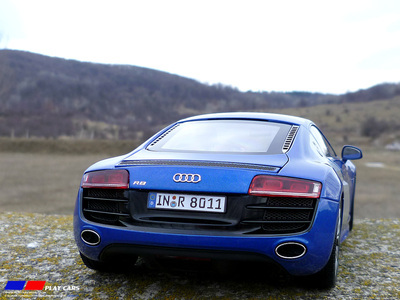 On the rear side the spoiler is covered by a thin real mesh and is functional, being activated by pushing a button underneath. I like how they reproduced the rear air diffuser including an air vent and the fog lamp. 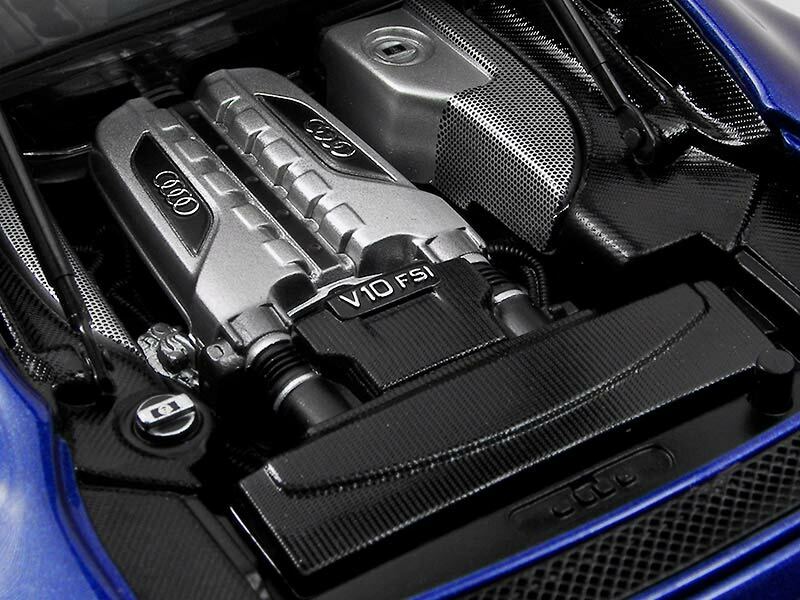 The manufacturer gave a particular attention to the fuel gap, designed as a raise part with the R8 indicative molded on its surface. At the door level we have a little error, because the superior edge is taller than the fender’s line and will come out every time you’ll look to the model. The rims are impressive, great detailed and have a strong realistic note. Are finished in smoked chrome and keep accurately the complex design. The lug nut appears to be a separate part, marked with the four circles logo. 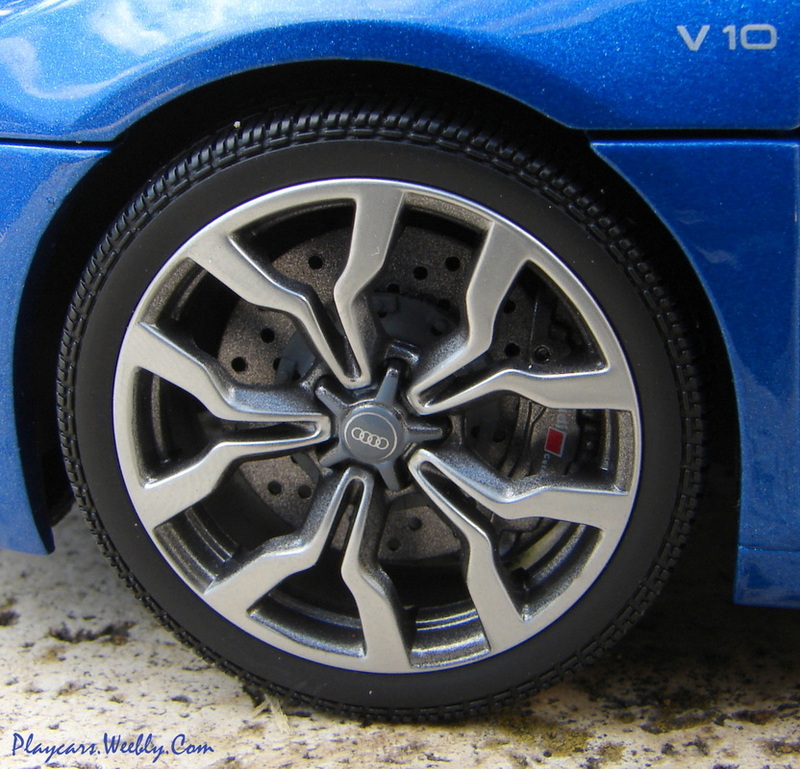 A great job can be seen on the brake system , that includes dimpled brake disks, with the same ceramic look from their real counterparts and huge calipers branded with the “Audi Ceramic” logo. Tires are keeping the generously proportions and a correct profile, but are not marked. In the box you’ll find an opening tool and you must use it to open the doors, because the space is very tight. The interior is very good looking, finished carefully and detailed with qualitative materials. All the switches and buttons on the central console were modeled and painted or individually marked. To replicate the navigation display and meter dials they’ve used a colored and legible sticker. The steering wheel is correctly shaped and has the commands modeled and marked. 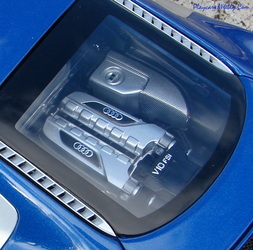 The same attention for detailing was used in replicating the pedals and the door panels. Seats are looking good, made of a rubbery plastic and have visible seams. All the interior is carpeted and the seat belts are textile made with photo etched metallic buckles. The R8 V10 comes standard with a 12-speaker Bang & Olufsen sound system and the 1:18 does as well with each speaker outlined with a chrome ring. 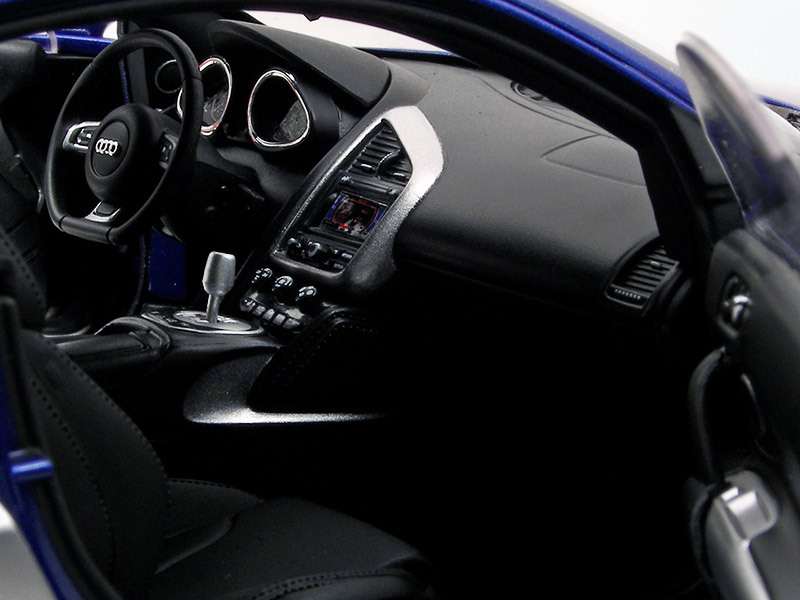 Some errors could be find here, too, like the missing carbon pieces around the central console and dash. The real car comes with a manual gear box, replicated by Kyosho without a clutch pedal. 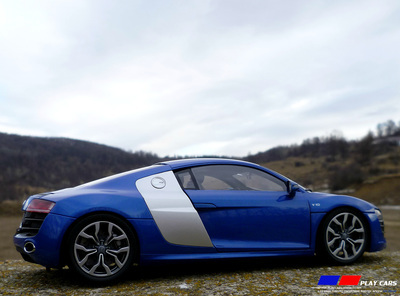 The rear lid keeps the engine visible trough its window and is surrounded by a very nice cut-in grill. Is opening and stays open using a pair of struts. The engine bay was detailed how much the real thing allowed. All materials keep a qualitative note. To replicate the carbon pattern, on its surface the plastic received a proper texture. Are not many things to be seen here, excepting some hoses hard to be observed under the engine profile. On the front side the bonnet uses the same strut system to open and reveals a carpeted compartment and a plastic plate in the middle. The single inconvenient is the huge classic hinges. 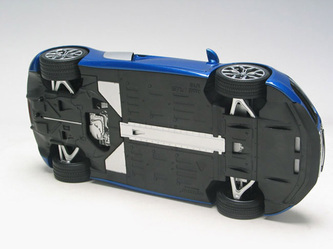 The undercarriage of the R8 is a thing of beauty as well. The aluminum control arms from the real car are present at each corner along with working suspensions. 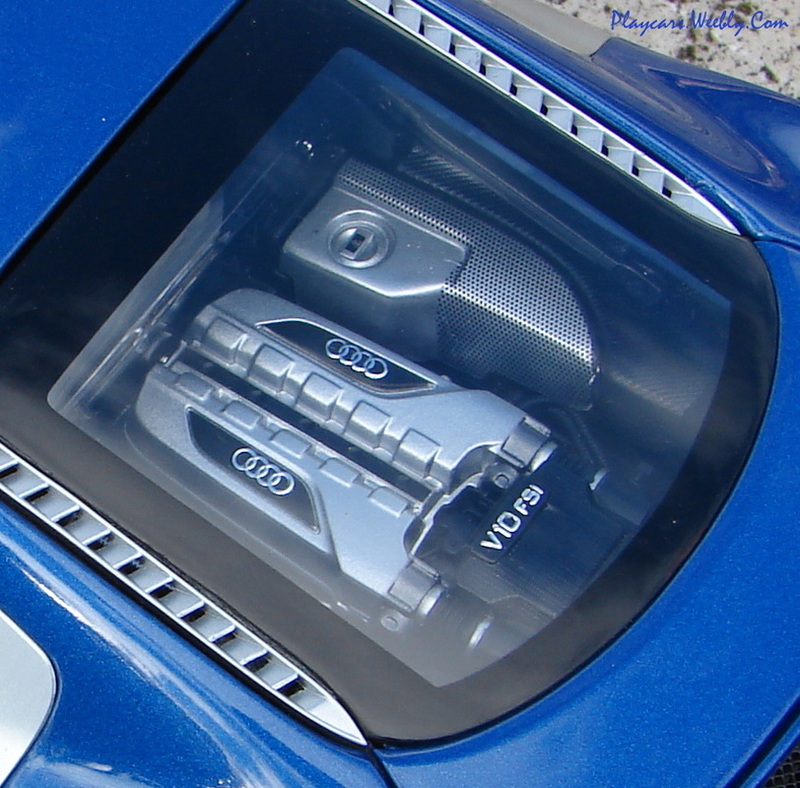 Also visible is the V10 engine, drive shaft cover and various cooling ducts and heat shielding. Personally I’m satisfied with this model and I recommend it in any version. Is well finished and detailed and I can ignore the few errors already mentioned. They don’t take credits from the model's general presence. The spectacular R8 will remain for Kyosho as long for Audi itself a reference model in their honors list.